Congratulations to the following schools and organizations that received GreenWorks! 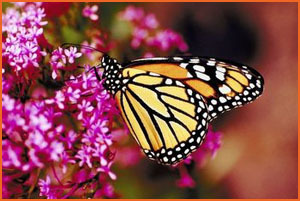 grants from Project Learning Tree for Butterfly Garden Grants through MonarchLIVE. A Butterfly Haven for the 21st Century: Under the guidance of a Habitat Team composed of teachers, administrators and volunteers, a student organization, K-Kids will establish a butterfly garden. Not only will this haven help to protect local butterflies, it will also create a meaningful way to integrate the science and technology curriculum for all students. "Tag!" You're It! A Butterfly Playground: This is a service-learning project which integrates community service and the new Science Sunshine Standards. The garden, targeted for Spring 2009, is an environmental project which will serve as an outdoor lab for all Layer Elementary students. Accessible to the local community, the garden is to enhance an area with 90% Florida native nectar and host plants. Beautiful Butterflies and Mystical Motivation: Sawgrass Springs Environmental Magnet School is located in Coral Springs bordering the Florida Everglades. The mission is to use the outdoors as the classroom to teach butterfly education. Middle schoolers are planting symmetrical a butterfly shaped garden with antennas, wings, and steppingstones to walk upon. An environmental work of art! Lawn Nation Butterfly Garden: TEENS (Teenagers Exploring and Explaining Nature and Science) will improve the existing Lawn Nation exhibit garden in the front entrance to the museum by adding plants that attract and provide habitat for native butterflies species. Interpretive signage will provide educational information to over 200,000 people that visit our museum annually. Fly, Baby, Fly! : This project will create a safe haven for butterflies to return to an urban area, bringing excitement, pollination, and enjoyment by students and community members alike. Designed and maintained by students, it will become part of an outdoor learning environment for all children in this neighborhood school. Selvidge Middle School Butterfly Garden: Morgan Selvidge Middle School in Ballwin, Missouri, will build a butterfly garden as part of a service learning project during the spring of 2009. This project is tied to state academic curriculum. The garden will include a birdbath, milkweed plants, and nectar-producing native flowers for the Monarch Butterflies. South Hancock Spreads its Wings: The purpose of this grant is to create a butterfly garden on the grounds of South Hancock Elementary School. Led by PLT facilitator-trained staff, second graders would work with teachers, parents, and community partners to participate in MonarchLive! creating a sense of community and beautifying their environment. Young School Garden of Learning: Students, staff, parents and senior citizen volunteers are creating a Butterfly Garden for the centerpiece of the Young School Garden of Learning. This intergenerational endeavor restores our ecoregion with native flower sanctuaries, Butterfly, Worm, Rock and rain gardens, facilitating cross -curricular learning and outdoor areas for adult studies and gardening. Intergenerational Butterfly Garden: The school’s Intergenerational Club, comprised of students, educators and seniors working side by side, will cultivate and nurture key varieties of annuals and perennials that support the monarch butterfly’s life stages. Both 4th and 5th grade students will use this outdoor classroom with their teachers during their study of life science. Creation to Migration: This project provides a learning laboratory for students at West Elementary School. This learning lab will be hands on and a real world application for our students who will be part of the planning, constructing and up-keep of the pollinator garden and document their discoveries. Students will learn about soil nutrient cycles, plant growth, pollinators and ecosystem function. The Master Gardeners of Athens County partnered with West Elementary to provide consultation, instruction and material support. Come Fly With Me is an extension of our School Garden Project that was started in 2007. Part of our school garden is currently unused and the volunteers from the School Garden Project along with my students think the rest of the garden should be a Butterfly Garden. Miles de Monarcas: Miles de Monarcas pollinator garden is a curriculum-based project based on experiential learning and hands-on experiences. Students, teachers and community have joined forces to provide habitat for migrating Monarchs and other important local butterfly species. Berry's Butterfly Monarch Mania: Berry’s Butterfly Monarch Mania is a place-based, service learning, hands-on Monarch butterfly/pollinator garden maintained by a self-supporting system created by curious and involved student hands, careful teacher guidance and community-based interest in providing supplemental habitat providing a sustainable Monarch corridor for the migration of this international symbol of freedom. Clear Lake High School Atrium: Clear Lake High School’s Earth Club plans to rejuvenate the atrium located at the center of its main campus. With funding, a welcoming butterfly garden could be added to currently dull space. Lee Outdoor Learning Area (LOLA) Monarch Butterfly Habitat: This Project will involve all students K-5 in a hands-on, service learning experience that will include collaborations with local community and University partners with the goal of creating a schoolyard habitat for migrating Monarch Butterflies as well as site for year round natural science observations and experiential learning! Kyle Elementary Environmental Study Center - Habitat Restoration Project: Kyle Elementary students are developing areas within their campus to restore habitats that will support wildlife. By planting native plants that provide food and shelter for insects and animals, we hope to surround students with more opportunities to learn about nature. A number of other organizations also providing funding for schoolyard gardens. Do you have an idea for a school/community native plant garden, a forest improvement project, a streamside restoration plan, a recycling program, or energy conservation project for your students? Need funds to implement it? Apply for a Project Learning Tree GreenWorks! grant! Kids Gardening offers grants and maintains a list of other grant possibilities. The Lorrie Otto Seeds for Education Grant Program gives small monetary grants to schools, nature centers, or other non-profit educational organizations for the purpose of establishing outdoor learning centers. The grant recipient learning centers are those which most successfully reflect the Wild Ones mission to educate and share information about the benefits of using native plants in our landscape and to promote biodiversity and environmentally sound environmentally sound practices. Only through this knowledge, can we appreciate humankind's proper place in the web of life. The deadline is October 15.